Antoine Griezmann scored a late equaliser in the Madrid derby as Atletico held La Liga leaders Real. Real took a deserved lead when Pepe, who later went off injured with broken ribs, headed home Toni Kroos' free-kick. The European champions continued to dominate but without really testing keeper Jan Oblak on too many occasions. And Griezmann levelled for third-placed Atletico when he slid home Angel Correa's through ball. Real are three points clear at the top of La Liga, with a game in hand on Barcelona, after Barca's 2-0 defeat at Malaga later on Saturday. 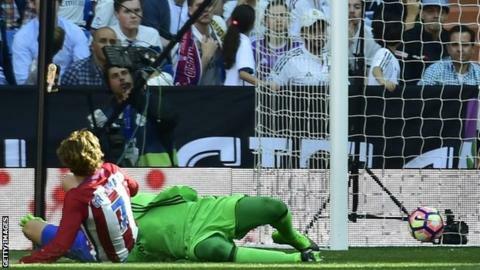 On the balance of play, Real should have won the derby - with Karim Benzema forcing a good first-half save from Oblak and defender Stefan Savic brilliantly clearing Cristiano Ronaldo's shot off the line. Defender Pepe injured himself after a collision with team-mate Kroos and is now likely to miss Wednesday's Champions League quarter-final first leg at Bayern Munich. Match ends, Real Madrid 1, Atlético de Madrid 1. Second Half ends, Real Madrid 1, Atlético de Madrid 1. Koke (Atlético de Madrid) is shown the yellow card. Substitution, Atlético de Madrid. José Giménez replaces Yannick Carrasco. Goal! Real Madrid 1, Atlético de Madrid 1. Antoine Griezmann (Atlético de Madrid) left footed shot from the centre of the box to the bottom left corner. Assisted by Ángel Correa with a through ball. Attempt blocked. Thomas Partey (Atlético de Madrid) right footed shot from outside the box is blocked. Assisted by Juanfran. Substitution, Atlético de Madrid. Thomas Partey replaces Fernando Torres. Offside, Atlético de Madrid. Juanfran tries a through ball, but Antoine Griezmann is caught offside. Attempt missed. Marcelo (Real Madrid) left footed shot from the left side of the box is too high. Assisted by Karim Benzema. Attempt missed. Gareth Bale (Real Madrid) left footed shot from the right side of the box is close, but misses to the right. Assisted by Daniel Carvajal. Substitution, Real Madrid. Nacho replaces Pepe because of an injury. Attempt blocked. Gareth Bale (Real Madrid) left footed shot from outside the box is blocked. Diego Godín (Atlético de Madrid) is shown the yellow card for hand ball. Hand ball by Diego Godín (Atlético de Madrid). Attempt saved. Fernando Torres (Atlético de Madrid) right footed shot from the centre of the box is saved in the centre of the goal. Assisted by Yannick Carrasco with a through ball. Attempt saved. Saúl Ñíguez (Atlético de Madrid) left footed shot from outside the box is saved in the centre of the goal.